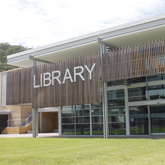 The Ourimbah Library at the Central Coast campus (Ourimbah) provides services to both Ourimbah TAFE NSW and University of Newcastle staff and students. Functioning as a multi-sector library allows our users access to a variety of resources provided by both the University and TAFE NSW. Unless stated otherwise, our services and resources are available for both Ourimbah TAFE and University of Newcastle staff and students. For more information about TAFE services please refer to the TAFE Staff and Students Ourimbah Campus Library Guide. The Ourimbah Information Common is open 24 hours and provides access to scholarly information and resources in a relaxed workspace. Services include wireless and laptop facilities and access to PCs, scanners, group study rooms, printing and photocopying. Staff assist with Library and basic IT support until 12am. Snack and drink machines, a cafe, newspapers and a lounge area are also located in the OIC. Swipe card access is required for entry after the main library closes.